Bondi Beach, I told you I'd be back. This time, however, you were the reward after a 14 kilometre run from Sydney's Central Business District (aka the downtown of any city in Australia). Who wouldn't want to run to this? I learned of this annual run on my last visit to Australia three years ago. At that time, it was a few days prior to race day and hence a bit late for a last-minute registration for a 14 kilometre run. 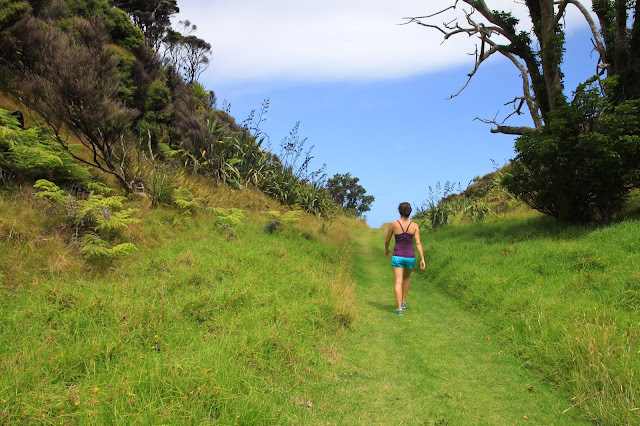 The idea of running from the city to the beach intrigued me so much so that the race occasionally entered my mind and eventually ended up on my bucket list. Little did I know I'd be running the race so soon, and running without much in the way of training in the weeks leading up to the day. (Physiotherapy disclaimer: not a good idea). Somehow getting settled into a new city and new job took precedence over training. This year's race (Sydney edition) took place on August 10th. There were over 65,000 runners with 25,000 of them in my starting group. With this many runners, it was hard to get away from the crowd before, during or after the run. There was plenty of energy to feed off of and it was augmented with live music and cheering crowds along the route. The weather called for a sunny day and therefore a last-minute scramble to purchase a running cap. Thankfully, the sun decided to sleep in and was a welcome sight only after crossing the finish line. Surprisingly, the run went by quicker than I expected. Anticipation as well as the motivation of a sea of runners may have had something to do with this. The course itself was quite hilly with an epic 2 kilometre hill at the halfway point. "Heartbreak hill", as it's known to the local running community, was definitely not a friendly one. For future runners, I recommend not asking for details about this hill and taking a quick photo break on the way up. Did I mention there were a lot of runners? Now how do I get around this? None other than the beautiful Bondi Beach. There's a reason this beach tends to be packed on so-called "beach days" - it is quite stunning. This day, the ocean temperature was not, at least in my opinion, warm enough for a swim, but it was a perfect substitute for the post-run ice-bucket. It was also not a bad backdrop for post-run photos. Photo with a Bondi lifeguard, anyone? Onto the next fun run! I'm addicted to FUN runs now! Copyright Feels Like Thirty 2014. Powered by Blogger.